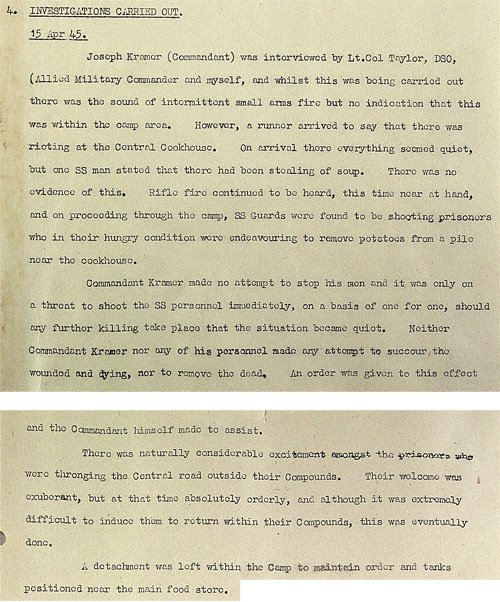 Joseph Kramer (Commandant) was interviewed by Lt.Col Taylor, DSO, (Allied Military Commander and myself, and whilst this was being carried out there was the sound of intermittent small arms fire but no indication that this was within the camp area. However, a runner arrived to say that there was rioting at the Central Cookhouse. On arrival there everything seemed quiet, but one SS man stated that there had been stealing of soup. There was no evidence of this. Rifle fire continued to be heard, this time near at hand, and on proceeding through the camp, SS Guards were found to be shooting prisoners who in their hungry condition were endeavouring to remove potatoes from a pile near the cookhouse. Commandant Kramer made no attempt to stop his men and it was only on a threat to shoot the SS personnel immediately, on a basis of one for one, should any further killing take place that the situation became quiet. Neither Commandant Kramer nor any of his personnel made any attempt to succour the wounded and dying, nor to remove the dead. An order was given to this effect and the Commandant himself made to assist. There was naturally considerable excitement amongst the prisoners who were thronging the Central road outside their Compounds. Their welcome was exuborant, but at that time absolutely orderly, and although it was extremely difficult to induce them to return within their Compounds, this was eventually done. A detachment was left within the Camp to maintain order and tanks positioned near the main food store. What does it tell you about the attitude of the British towards Kramer and the SS? What does the writer say which tells you this?